Pathiyam means food and diet control. Each food has its own diet restrictions. The sort of diet to be restricted or added depends on various factors. 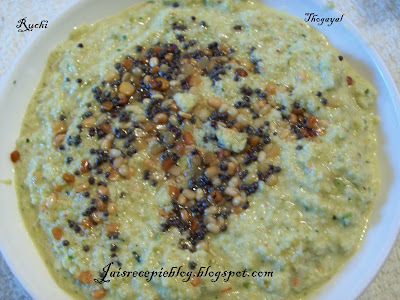 Tamil cuisine is known for its aromatic, flavourful and sometimes spicy food.Thogayal is a Tamil word for Chutney. Thogayal is common in most South Indian households specially when you need something tasty and need it fast. I used to prepare thogayal of different kinds… thogayal with dals, coconut, vegetables like pumpkin, peerkangai ( ridgegourd ), brinjal, karuveplai(curry leaves), coriander etc,. These recipes create an unique blend of spices, that makes the food very appetizing, nutritious and wholesome.,. 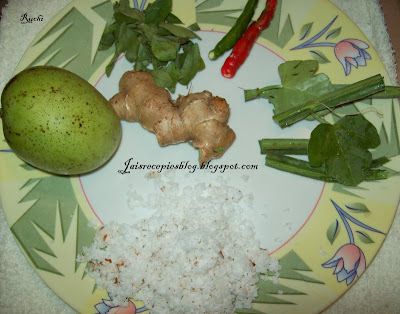 Curryleaves, Ginger, mango, Chillies, coconut etc add the zest for this thogayal. Curry Leaves: The botanical name for karuvepilai is Murraya koenigi. he leaves are small, pointed and in clusters, giving of a strong aroma faintly reminding one of citrus and anise. The aroma is delightful when added to curries and while frying spices, and lends that extra something to south Indian dishes. The leaves, bark and the root of the plant are used in indigenous medicine as a tonic, stomachic, stimulant and carminative. The leaves taken with pepper early in the morning in empty stomach reduces blood sugar. An infusion of the roasted leaves is used to stop vomiting. The dry leaves are ingredient for many herbal medicines. The juice of the root is taken to relieve pain associated with kidney. Pirandai Edible Stemmed Vine( Cissus quadrangula) Uses:Medicinal Properties and Uses: Pirandai (Tamil)is mainly used to heal bone fractures. It is one of the very frequently used herb by traditional bone setters of India. It is also used for piles, asthma, digestive troubles, cough, and loss of appetite.Salt of pirandai can be used to cure ulcer.Contains Calcium: ideal for children and women. Ginger :Ginger comes from the root of the ginger plant. It is valued throughout the world as a spice used in cooking and baking. It also may have some medicinal value. The traditional uses of ginger include treatment of ailments involving the large intestine and colon, nausea, indigestion, paralysis of the tongue, morning sickness, vomiting, hot flashes, menstrual cramps and gas. ginger is used to prevent motion sickness, two to four grams daily is most effective. Mango:contains essential vitamins and dietary minerals. The antioxidant vitamins A, C and E.
1. Heat 1 tsp oil in a small pan and stir-fry the sliced pirandaifor 2-3 minutes, till the slices start to soften. Remove from the pan and set aside. 2. Heat the second tsp of oil in the same pan and fry the red chillies, channadal and curry leaves till the dal turns golden. Remove the chillies and set aside. 3. Grind the fried chillies, coconut, tamarind, Mango. Coconut, ginger, pirandai curry leaves together, using only as much water as required to make thick but finely ground mixture. 4. When all the ingredients are ground up properly, add the rest of the tempering (the mustard seedsand urad dal) along with salt to taste and grind for another 20 seconds, so that the dal shredded but not completely amalgamated. 5. Serve as a side dish with idli, dosa, curd rice , , or eat it mixed with ghee and steamed rice with any vegetable dish. I am going to definitely make this this weekend..Reminds me of my mom's thogaiyal..Every saturday or Sunday, there will be patthiya sapadu in my house, jeera-milagu rasam, patthiya kozhambu, poondu kuzhambu...this weekend, am going to prepare this..Super Jaishree..Thx for reminding me and sharing this wonderful recipie.. Mouth watering Jaishree!I am great fan of thogaiyals,looks great! healthy and yummy combination of ginger and mangoe! Interesting recipe! Thuvaiyal sounds interesting...I am glad that you get pirandai and curry leaves there. Hmmmm can only think of it when I travel to India. I am a avid fan of thogayal and curry leaves are a must in my kitchen. I can't make do without them! Looks great. never used mango in thogayal.. i love each and every ingredient u used in this recipe. will try for sure. wow... thats awesome! I love all recipes that call for mango as an ingredient. I could virtually taste the flavour of that. New one Jaishree.Looks good.Reminds me of my grandmom,she used to make Pathiaporuchakozhambu and kootu. Yum Yum...slurp slurp... this would taste sooooo good with curd rice.........will try it soon.. Thanks for your lovely comments Jaishree..
my mom is expert of preparing all types of thogayal.even now i cant touch her taste... hm.. yrs looks as same as my mom's and super duper pathiya thogayal dear.. very healthy yet tasty. Very tsty and healthy recipe. nice information , thanks for sharing. Hi friends thank u all for loving comments. Nice to know u all like this recepie. Pirandai is not available in mumbai.It is frm my kitchen garden. Pirandai is a new ingredient all together for me. Thogayal looks yummy with all the nutritional values in it.